Here are my Top 3 Gadgets of the moment. You may need them, too! This handy little oiler has a long, thin tip at one end and a pushbutton at the other, making it possible to dispense just one drop of machine oil in the tight recesses of your machine! 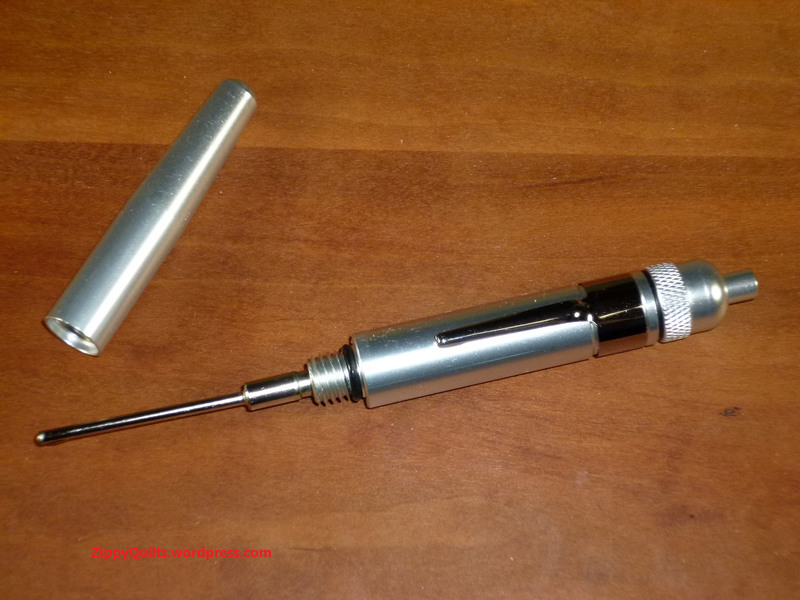 It comes with a secure screw-on cap so you can even carry it around in your pocket like a pen if you want to. So far mine has never leaked when I’ve thrown it in my gadget bag for workshops and retreats. My sweetie got mine on Amazon HERE, though there certainly there may be other sources. My husband got these for me at a big box home and hardware store, but I’ve seen them at quilt shows, too. The price varies wildly for what appears to be the same set of attachments, so I say shop around and pay less than $10. These are especially useful for cleaning a serger because a serger gets so messy so fast, but I use them happily on my regular sewing machine, too. 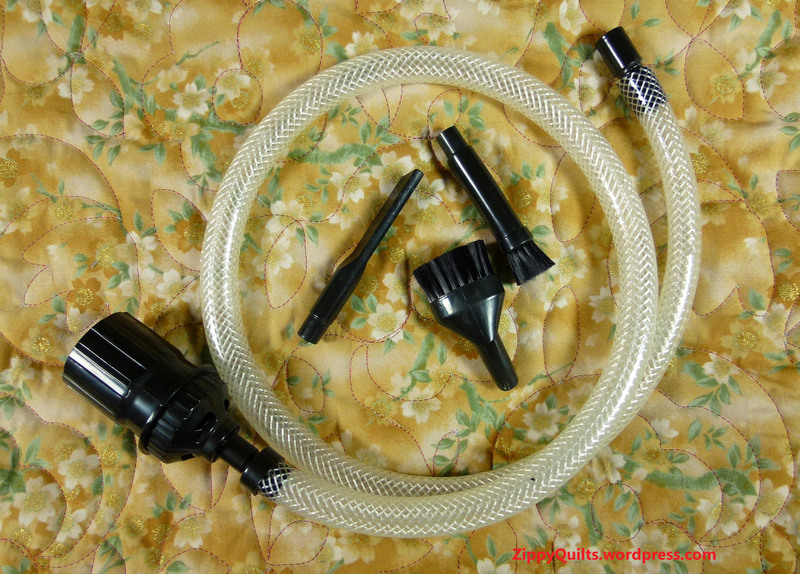 Just attach the adapter to your regular vacuum cleaner and the little attachments clean those hard-to-reach areas of either machine. I could still use an even smaller tip, but it’s a big improvement over using only a cleaning brush with no suction. 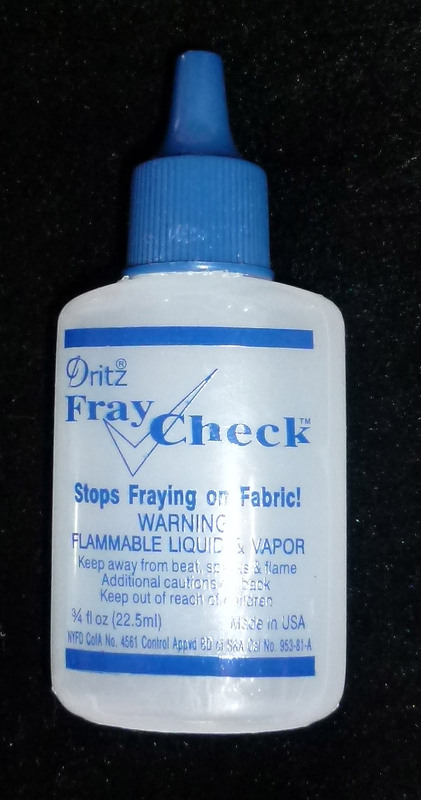 Fray check. Well, it isn’t exactly a tool, but it has many uses this time of year 🙂 I apply it to ribbon ends so they won’t fray and outline my iron-on applique with it before I sew around the edge. I don’t do a lot of iron-on applique on things that will be washed, but this makes me feel a little more secure when I do. And shown below IS the latest iron-on applique, which I’m showing just for fun. I made the onesie tie with a tutorial from a blog called Crap I’ve Made. I love it! 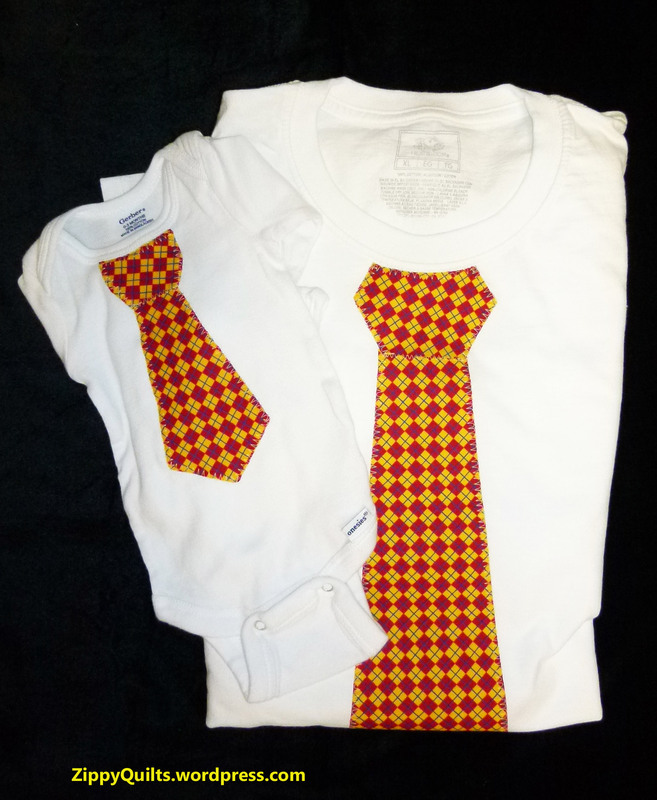 Then I made a pattern from one of my husband’s ties and made a grownup-size T shirt for the Father of the child, so they can match! So: go drop a few hints! This entry was posted in Quilting, Sewing and tagged applique, gadgets, Quilt, quilting, sewing, sewing gadget, sewing machine by zippyquilts. Bookmark the permalink. Well aren’t you just clever!! love it.